Not one of the opponents of the Unison motion even tried to defend Israel’s actions in the occupied territories. Their argument that it was better to maintain dialogue was reminiscent of the arguments that were used against the boycott of South Africa and merely reinforced the image of arrogance and intolerance. What does it matter if Israel is the site for the production of Intel chips? Did the fact that Hitler built the autobahns make his regime any the less murderous? The suggestion that Israel is being “singled out” omits the fact that Israel has laid claim to being the Middle East’s only democracy. I was overwhelmed by the reaction of delegates, especially black members, to my contribution at the Unison conference, because it is black people above all who see the similarities between the treatment of the Palestinians and what happened in South Africa. How can anyone justify Jewish roads in the West Bank or different laws for Jews and Arabs? In recent months, Israeli opinion polls have shown that 61 per cent of Israelis consider a Jew marrying a Palestinian as “treason”. Two-thirds of Jewish respondents have said they don’t want to live with an Arab and that they want to see the transfer of Palestinians out of Israel. This is what is mobilising support for a boycott, not antisemitism. Richard Kuper, of Jews for Justice for Palestinians also has a letter in the same section. May I, as a member of the UCU opposed to the boycott, take issue with the Chief Rabbi (JC, June 15). UCU is a democratic union. The resolution merely commits it to a discussion of the issues in every branch. There will be no boycott until a majority of members vote for one. The Chief Rabbi’s knee-jerk, hysterical misrepresentation of what is the opening-up of a debate is unlikely to garner support for voices of reason. His comparison of UCU with Hizb ut-Tahrir is scurrilous, and a textbook example of the demonisation he so strongly opposes. There was a curious incident at the UCU Congress the day its members voted to call for a boycott against Israel. That day, the union voted unanimously to oppose government plans urging them to fight extremism on campus. They had been asked by the government to monitor potential terrorists. They refused, saying that it amounted to a "witch hunt". They then proceeded, seemingly unaware of the contradiction, to start a witch hunt of their own against Israeli academics who, they deemed, were guilty of "complicity" in the policies of their government. Why, I wondered, is this witch different from all other witches? Why is "demonisation" the language of the earlier resolution, permitted in one case (Israel) and forbidden in another? It is a question that haunts me, as it should haunt everyone who knows the history of witch hunts and where they lead, in this case straight to an assault on academic freedom. Probably a fair few think that ENGAGE is a bit over the top. It now looks like Jon Pike may be guilty of the over the top-ness that "probably a fair few think that Engage is". The Jewish Chronicle has an interesting article on a poll by Populus commissioned by the Britain Israel Communications and Resource Centre. It carries a breakdown of a poll of "business, cultural and political" leaders. The "surprise result" for the JC is that a clear majority of 62% said that they did not see the boycott as antisemitic. Now this is curious. Members, leaders and founders of the boycott movement have insisted that the boycott isn't antisemitic. Many people have said, whether they support the boycott or not, that it isn't antisemitic. And yet the JC is surprised at that particular result. It's not surprised at the fact that 86% of those polled are against the boycott. I mean when so many people support a boycott why not be surprised at that result? I think the secret here is in the words "opinion formers" and "business, cultural and political leaders." Who are these people? We know they mostly oppose the boycott. Were they handpicked? Mr Lapid reportedly told a cabinet meeting that Israel should "have another look" at the route of the barrier, which at times cuts deep into the Palestinian territory and would affect hundreds of thousands of Palestinians. He warned that the upcoming hearings by the International Court of Justice at The Hague over the legality of the barrier could be the first step in Israel being treated like apartheid-era South Africa. "There is a danger that we will be exposed to an international boycott as was the case before the fall of the regime in South Africa," Mr Lapid told the cabinet, according to his spokesman. Mr Lapid, who is the leader of the secular Shinui Party, said Israel had brought this on itself for not sticking to the original route of the barrier along the Green Line. Ok, still a nasty chap but I think his fear speaks volumes as to the worth of a boycott, any boycott, academia, goods, anything. Olmert's problem, and in fact the problem faced by all of us, is that in reality one cannot fool all the people all the time. Certainly not the Palestinians, who continue to see on a daily basis how more land is being taken away and paved under the wheels of the settlement and annexation machine, which does not rest even for a day. At one location land is being seized for building the fence, with "only" 80 percent of it being built east of the Green Line, that is, in West Bank territory. Elsewhere land is being seized in favor of expanding one or another "consensus settlement." Simultaneously, at the heart of the West Bank, settlers who are fans of organic agriculture, plant vineyards on land that up until recently was worked by Palestinian farmers, while yet another bypass road is being paved on land confiscated with the High Court's approval for "public benefit." After all, in the West Bank everything is always done for public benefit – the Israeli public that is (which accounts for only 10 percent of the West Bank's population). In order to calibrate the national expectation gauge of the Sharm el-Sheik summit and the festive declarations that followed it, it would be worthwhile for us Israelis to one day clarify to ourselves, among the other terms we use routinely in order to describe our realities, the term "consensus." The Even-Shoshan dictionary defines the term as follows: "general agreement," "unanimity," or "homogenous position." Where then does consensus have to prevail when it comes to the issue of settlements? Are we talking about a consensus between the Labor and Kadima parties? Or perhaps a consensus between the settler Right and all those who have yet to pledge their allegiance to the notion of the Greater Land of Israel? Olmert's problem is that he can't fool the Palestinians? But he's not even trying to fool the Palestinians. He's got the Quartet on his side. Sir: Satire is dead. 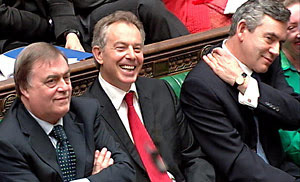 Under Blair's leadership, Britain has colluded in the invasion, occupation and utter devastation of Iraq, blocked UN action to end Israel's invasion and bombardment of Lebanon, conspired with the EU, US and Israel to impose a crippling economic blockade on the Palestinian people, and refused to implement the earlier wishes of the European Parliament to suspend Israel's preferred trading status with the EU. And now this war-mongering, hypocritical, war criminal's apprentice is to be appointed a peace envoy to the Middle East of all places. Of course the same or similar has been said about Kissinger and Begin getting Nobel peace prizes and satire hung in there long enough for this latest assault so who knows? See that? "Blair named Mideast envoy" - CAUSE. "Israel kills 12 in Gaza" - EFFECT. Ok, they ran their piece before I ran mine so it's not a me exclusive, but chilling stuff, huh? Prime Minister Ehud Olmert called outgoing Blair "a true friend of the State of Israel," on Tuesday evening. We call on you, as President of the European Commission, to resist pressures from outside Europe to appoint Tony Blair as special envoy to the Middle East on behalf of the "Quartet". We have no confidence that Mr Blair will act impartially and we want to see a person appointed to this role who understands the rights and needs of everyone in the Middle East and who will work for a just and lasting peace for both Palestinians and Israelis. I don't suppose it could hurt to sign it. UPDATE: I just signed and the number of signatories rose by ten between my going to the site and adding my name. This is ludicrous and a recipe for more disasters for the Palestinians. It's one of those news reports which has you checking the calendar to see if it's April 1st. According to the news on Yahoo, Tony Blair, an honorary patron of the zionist Jewish National Fund, is to be made the so-called Quartet's envoy to the Middle East. Tony Blair is set to be confirmed as a Middle East envoy according to reports. If the so-called Quartet can reach agreement on the appointment, the outgoing Prime Minister would play a key peacemaking role in the Palestinian territories. The White House revealed last week that Mr Blair, who steps down as premier on Wednesday afternoon, was in line for the nomination. His official spokesman has refused to talk about Mr Blair's post-Downing Street plans. Number 10 again declined to comment, despite claims that the Quartet was close to an agreement and an announcement was imminent. The position has been vacant since former World Bank chief James Wolfensohn quit the post in April last year. It would give Mr Blair a central role in future efforts to secure peace between Israel and the Palestinians. The appointment is said to be on the agenda for talks in Jerusalem between officials of the Quartet powers the US, the United Nations, the European Union and Russia. US president George Bush and Secretary of State Condoleezza Rice are thought to have been pushing for Mr Blair's nomination for the role. So no serious approach to peace in the Middle East for a generation then. Yes all those things in one article by Gabriel Ash in Dissident Voice. Gabriel has picked up on the leader of the UK's Universities and Colleges Union, Sally Hunt's stated reason for not personally supporting boycott, divestment and sanctions (BDS) proposals against Israel. When I speak to members, they tell me they want their union to focus on pay and conditions. Well, in his article, Why Boycott Israel? Because It’s Good for You, Gabriel says that the campaign for BDS is a part and parcel of the struggle for improved pay and conditions. The major argument for boycotting Israel is that it is the right thing to do. And it is. But for those of us who live off wages and depend on public services, it is also the smart thing to do — especially in Europe, where the BDS campaign is now facing a vocal onslaught. Support for Israel is an important pillar of an islamophobic, anti-immigrant and pro-war front, which includes many in the political leadership of Europe; their final prize is finishing off the welfare state. In the second part, I will also show that it is this front — not the UCU — that is heir to Europe’s historical anti-Semitism. What then lies at the root of this quite natural alliance between Christian fundamentalists, market fundamentalists, billionaires, Zionists, islamophobes, and garden variety warmongers? Karl Schmitt, the Nazi philosopher of law who theorized the way to defend the Christian state from the twin evil of communism and liberalism, identified the essential basis of political authority in the power to name the enemy. For Schmitt, while leftists see the enemy across town, in the ruling class and the state, the problem with liberals is that they see no enemies. Communism must be opposed; but the liberal alternative is not up to the task, since, without enemies, politics degenerate. To defeat the liberal atrophy of politics as well as labor’s militant tendencies, Schmitt saw the necessity of having an existential enemy, one that the whole state can be fully mobilized against. The enemy creates the conditions for the exercise of decisive state power, free from the restraints imposed by law and the deadlocks of parliamentary politics. Although the debt is rarely acknowledged, that has been the guiding principle of right-wing reaction. One could read Huntington’s “Clash of Civilization” thesis as the globalization of Schmitt’s insight. While originally presented as descriptive, the “Clash of Civilization” has been so influential because it is in practice a political program, one tailored to combat what Huntington himself called elsewhere “an excess of democracy.” Does one needs to mention that Huntington also looks askance at unions? The raw Schmitt, however, is too clearly reactionary. The new Schmittianism of the Islamophobic front is a rightwing reaction veiled in the trappings of the traditional left. I printed the article off to read it and it ran to ten pages so my little snippets can't do it justice. Well worth reading the whole thing. While it may seem trivial, some argue that the lack of Arabic skills among Israeli politicians is one of the greatest impediments to peace. If you think that is an exaggeration, ask Moshe Shahal, a former member of Knesset for the Labor Party and a former negotiator. “In my opinion, 50 percent of the Israeli-Arab conflict is a problem of culture and language,” the Iraqi-born Shahal says. Shahal, who speaks Arabic fluently, cites a past incident to support his premise. It was 1984. Israel and Egypt had signed a peace agreement five years earlier, but there remained a dispute over who should get Taba, an Egyptian village in the Sinai Peninsula. Shahal, who was Israel’s energy minister at the time, recalls a conversation he had in Egyptian President Hosni Mubarak’s house in Egypt. Mubarak had been surprised to hear Shahal deliver a speech in Arabic at a reception a day earlier. Shahal was stunned. After all, he was a low-profile cabinet minister, not a head of state. “I thought, maybe I didn’t understand his Egyptian accent,” Shahal recalls with amusement. What? Israel is a throwback to colonialism? No! And a junior minister has only just discovered that? But what's all this? Mubarak said, "They’re condescending. They tell us what to do." So what do you do when Israel's diplomats tell you what to do? Seriously though. Israel had been talking openly with Egypt for about seven years by 1984 and this was the first time that Mubarak felt that he had not been condescended to and told what to do by Israel and that was with a junior Israeli minister. I wonder how many Israeli Arabic speakers have met with him since then. I think the language thing is merely a symptom of a zionist disdain for all things native to the Middle East. It occurred to me while reading the article that if language was so conducive t peace those many Palestinians who now speak Hebrew could have achieved peace. But isn't that part of the problem? The Palestinians didn't turn up in Palestine one day with a language contrived for their own exclusive nationhood. Their Arabic language grew up over time with its own local dialect. The Israelis are people or the descendants of people who knew that there were native Arabic speakers in the area. So surely it's for them to learn the local language not the other way round. And clearly Palestinians learning Hebrew hasn't settled anything. Would Israelis learning Arabic make a difference? Well it might well signify an attitude change from the politics and culture of Jewish supremacy to something that accepts the equal status of all. I just stumbled on this BBC report on the take of three Gazans on the new situation with Hamas ruling the Gaza strip. The report's about 4 days old now so who knows what might have happened in a fluid situation. The Beeb talks to three Gazans, though from their bios they don't look very typical to me. First up is a businessman, Mamoun Abu Shahla. There was the possibility of leaving today with the foreigners, but I decided to stay here. I feel responsible because I'm on the board of directors of the Bank of Palestine. We expect a stream of financial difficulties in the coming weeks. For the time being at least, we have better security. Hamas are dominating everything at the moment and we are not expecting any struggles from Fatah. The leaders have left and morale among those left is low. I believe these Hamas people won't live long. There will be a big financial siege. We don't have ports or airports - everything has to come from Israel. We need at least 350 trucks to come in daily and at the moment only the Kerem Shalom checkpoint [in south-east Gaza] is open - with a capacity of 18 trucks a day. There will be a continuous shortage of everything in the country. Difficulties lie ahead and the people will suffer. Hamas don't have any option but to return to a coalition. This won't happen in the near future, but after several months. The problem is not the politicians, but the guys in the street with guns in their hands. Better security? Who from? That's left unsaid. I live in Rafah but travel to Gaza City for work. The journey is fine now; there are no checkpoints on the road. It only takes me about 10 minutes to get to work. Since Hamas gained control, students have come back to take their exams. No one liked what happened, because so many people were killed. But even before the clashes, people were suffering. Families were taking revenge on each other. Everyone is safer now. People have been told to hand in their weapons. But who knows what will happen in the future. Nobody will accept two governments, not even the Palestinian people. Hamas and Fatah have only one path they can go down: negotiation. They can't ignore each other forever. I have American citizenship so I could leave Gaza, but I have no intention of doing so. I know nobody else who is trying to go. Any talk of people leaving is propaganda. Nothing has run out, no-one is starving. Things are quiet now, but this could mean two things. Either it really is calm, or it's the calm before the storm. You can't tell. I think what happened last week was really wrong - Hamas taking power by force. We are one nation and it cannot be solved with weapons. But the West and Israel are also to blame. If the West really thinks it knows what's best for us - why did we bother with elections? If I were a Hamas supporter (and I am not, I don't support any party), I would be supporting them now. I don't like to be oppressed like this. It's not right. As you know, the Gaza Strip is like a prison. It was never free. Israel still controls everything - the border, the air space. Don't blame the Palestinians for not making it a modern country. Mabrouk guys! You did it! Start you spin now. Tell us how you did it for us, for Palestine, for the people, for security, for dignity, for the land, for history, for the future of our kids. Tell us and we will believe you because you are the "victors" who "liberated" Gaza (again) and freed its people (again). You can do it again and again and again. Because words are cheap. As cheap as the blood you can now dip your fingers in to draw on your faces your victory sign. These are improvisations: neither a manifesto nor a treatise because life is too complicated for either. Yet, I'm improvising as an Arab--Palestinian-- woman with a progressive point of view always under construction. Since I often find myself caught between anti-Arab racism and arab reactionary politics, both of which threaten to gag me, I'm raising my voice against both, hoping in the process to contribute an improvised note to a progressive Arab blogosphere. Probably a good reason not to take sides in any internal dispute here but to make support for the Palestinians unconditional. Foreign Ministry spokesman Mark Regev said in response: "Jerusalem is Israel's capital. It is the right of every sovereign state to determine which city will be its capital..."
So can the UK make Paris its capital? Or maybe the USA can make Baghdad its capital. No, a country cannot simply declare another country's city to be its own. And even if it does so declare, the BBC doesn't have to accommodate the fiction. This Conference condemns the Wall which Israel continues to construct in the West Bank, in defiance of international law. The Wall separates Palestinian farming communities from their olive groves, schools, hospitals and neighbouring communities. Together with the expanding and illegal Israeli settlements in the West Bank, the network of checkpoints, and roads on which Palestinians are not allowed to rave, the Wall enforces an apartheid colonial society. In July 2004 the International Court of Justice deemed the Wall wholly illegal and ruled that it must be dismantled and the victims compensated. It required States, including Britain, to ensure that Israel complied with this judgement. In reality, the British Government has ignored this and accepted the Wall. Conference believes that trade unionists should uphold the International Court of Justice decision by participating in direct solidarity with Palestinians affected by the Wall. 2. Join other national unions (UNISON, TGWU, UCATT, FBU, CWU, PCS, RMT, NUM, NATFHE, TSSA) in affiliating to the Palestine Solidarity Campaign. a. contacting the Palestinian Stop the Wall campaign www.stopthewall.org and the Popular Committees Against the Wall, in particular in the village of Bil'in where non-violent mass demonstrations are being held weekly. b. Investigating how industries organised by our union may be involved in constructing the Wall. 4. Inform the Amicus Parliamentary Group of our policy on this issue and seek their active support in influencing Government policy. According to Roland Rance on the Just Peace UK list this resolution passed unopposed. What this says about zionist organisation and activism in the union or in unions generally, I don't know. Maybe you just don't get much for your two million quid these days. One of the headlines with the above article in the print edition was £2 million for Israel lobby. They'd better make it £4 million, £2 million for the Israel lobby and another £2 million for the "there's-no-such-thing-as-an-Israel lobby" lobby. But check out the lead article on the front page. A certain comrade Greenstein gets a mention. The Unison motion, moved by its Wolverhampton branch, was warmly welcomed by the Palestine Solidarity Campaign. It had “recognised that a campaign of boycott is necessary”. The PSC also praised elements in the motion demanding Israel’s withdrawal from the territories and the right of Palestinians to return to their pre-1948 homes. The motion sparked an impassioned debate at the conference, with the chairman appealing to speakers not to shout into the microphone. Proposing the motion, Tracy Morgan said boycotting Israel was “controversial” but not an end in itself — it was a move “towards ending the occupation”. Before the conference, 33 union members announced strenuous opposition. “In Britain, a boycott-Israel movement would, inexorably, become an anti-Jewish movement,” they said, in a letter to The Guardian. No, not inexorably, but a little scroll down the comments to this Socialist Unity site page suggests that we mustn't be complacent about antisemitism in the movement. If it gets a foothold, all the work on the boycott resolutions by principled anti-racists will unravel. There are antisemites out there who, mindful of the fable of the boy who cried wolf, are ready to exploit the Palestine solidarity movement for their own ends, whatever they are. I'm sure they can make anti-zionist noises but a glance at their targets shows that their enemy isn't zionism at all. The New Statesman has a cover story on Gaza this week and it has a poll on whether there should be an academic boycott of Israel. At the minute there's 59% in favour of a boycott. There's also a comment facility. I've always said that Israel stands out from other states in that whereas all states abuse human rights from time to time, Israel's very existence is predicated on it. Well now, according to Ha'aretz, the permanence of Israel's human rights abuses are enshrined in the UN Human Rights Council's agenda. The United Nations Human Rights Council on Monday voted in favor of making Israel's actions a permanent item on the council's agenda. The council, based in Geneva, was formed approximately a year ago as part of a reform initiated by former UN secretary general Kofi Annan. The UN voted to replace the Human Rights Commission with the council in an attempt to address both criticisms of the commission's composition, which frequently included some of the world's worst human rights abusers, and what Annan once termed its excessive focus on Israel. Yitzhak Levanon, Israel's permanent representative to the UN in Geneva, told Haaretz: "Last year, we buried that infamous commission to replace it with something better. Now, it appears the same old commission has returned." Now this is interesting. The commission was scrapped to protect Israel but now the council is condemning Israel and permanently. It can only be that Israel represents a standing breach of human rights, can't it? Ok the news. The UK public sector union, Unison, has voted for an "economic, cultural, academic and sporting boycott" of Israel. Hm, I thought they might lack objectivity so I checked out Engage. Sorry, just kidding! I checked out Engage for things like the vote, the breakdown, the motion itself and the apoplexy. I have to admit to being disappointed by the lack of that last one. In fact they've only received (or approved) 4 comments. 5) respect the Palestinian people's right to national self-determination and to establish a state in the West bank and the Gaza Strip with its capital in Jerusalem. Conference notes that the Israeli occupation has now continued for 40 years. It welcomes the formation of the "Enough!" coalition to focus protest on this anniversary. But Conference believes that ending the occupation demands concerted and sustained pressure upon Israel including an economic, cultural, academic and sporting boycott. Conference condemns the economic sanctions imposed upon the Occupied Palestinian Territories following Palestinian Parliamentary Elections of 25 January 2006, which make worse the appalling economic circumstances of the occupation. It is a unique example of economic sanctions imposed, not upon an occupier, but upon a population struggling against illegal military occupation. h) encourage branches and regions to affiliate to the Palestine Solidarity Campaign (PSC), help build PSC branches and consider twinning with PGFTU organised public sector workers in Palestine. Seems to be a call for a two state solution there so what's Engage saying this for? Now this goes to the heart of the problem in my view. Israel complying with international law means that Israel cannot exist because its existence is predicated on on-going breaches of international law. But in fairness that might not be what Dr Hirsh (Engage) meant. He may have been referring to the call to "allow the refugees of 1948 to return home." This is the usual race card played by zionists. If the right of return is allowed then every Palestinian from Jordan to Pasadena will up and invade Israel. I've been at Alliance for Workers Liberty meetings where their leader has called the right of return an "Arab chauvinist invasion." Actually if the right of return was granted tomorrow I doubt if the impact would be instant or even soon. But what's curious about what Engage has done is that it has posited international law and the right of return as amounting to dismantling Israel as a Jewish state. The right of return is a part of international law. Of course, you might ask as to why Unison expressed them separately. I think it was to draw special attention to the situation of the refugees. But I think Engage really are saying that international law is an enemy of Israel. If that's what they're saying then I agree with them this time. Dershowitz is as sincere as Engage? People must make their own judgements about who they associate with. But I wouldn't feel able to participate in a meeting that features a close associate of Alan Dershowitz. (Obviously, I'm thinking of Anthony Julius here.) Dershowitz has publicly advocated "needles under the fingernails" of terrorist suspects and has written of a "continuum of civilianity" that reduces the immunity of (Lebanese) non-combatants to attack. He's also, through his attack on Finkelstein, shown himself to be an enemy of academic freedom and free inquiry (as well as making disgusting and unwarranted claims about Finkelstein's mother). I realize that some people take the view that their enemy's enemy is their friend. But Engage is supposedly signed-up to various principles about the universality of human rights. By contrast, some people who are opposed to the boycott are opposed to it simply for reasons of ethno-nationalist partisanship. They should be given a wide berth. I'm disappointed that Engage doesn't seem to share that view. Chris this is all a bit tenuous, isn't it? Dershowitz made his case against the boycott - which he doesn't make in terms of "ethno-nationalist partisanship". Julius is "associated with" Dershowitz - because they wrote a piece together - what is your critique of that piece? And because they together offered legal assistance to those discriminated against on the grounds of nationality - what is your critique of legal assistance? We are "associated with" Julius... And now you accuse us of only "supposedly" being "signed up to" various principles about the universality of human rights, but you imply that we are only pretending. I don't see how any of this is worth responding to and I don't see how any of this is worthy of you, Chris. Anti-Semitism consists, first, of beliefs about Jews that are both false and hostile, and secondly, of injurious things said to or about Jews, or done to them, in consequence of those beliefs. It is no enlargement at all to rewrite this definition as follows. Anti-Semitism consists, first, of beliefs about Jews or the Jewish State that are both false and hostile, and secondly, of injurious things said to or about Jews or the Jewish State, or done to them, in consequence of those beliefs. Anti-Semites wrong Jews and the Jewish State, and they are wrong about Jews and the Jewish State. Many antiSemites also want to hurt Jews and the Jewish State or deny to them freedoms or rights enjoyed by nonJews or the generality of states. There we have it. Nothing to betray any ethno-nationalist partisanship there. Isn't to put some clear water between Engage and Dershowitz? Chris, you think our criticism of Livingstone constituted playing "guilt-by-association card" with Qaradawi? Firstly your chosen phraseology makes clear that you think our politics is dishonest. As above, when you say Engage is "supposedly signed up to" now you say we play a card. I think you make a very serious allegation and I think you should provide some evidence or withdraw it. Your allegation is that we dishonestly claim to be antiracist and that we dishonestly claim to support human rights but in truth we cynically play arguments as though they were cards and we lie about what we really think. Your claim is that we are liars for Israel. Your claim is that we pretend to worry about antisemitism but really we are only concerned with de-legitimizing criticism of Israeli human rights abuses. A very serious charge in my view, and one that you cannot sustain. As for Livingstone - my own case against Livingstone does not rely on the fact that he, in the name of London, welcomes mysoginist, antisemite and homophobe Qaradawi to city hall as an honoured guest. Livingstone himself has been on the nasty wing of British anti-Zionism for all his political life - since he was an editor for the WRP front newspaper "Labour Herald". Livingstone understood that his trivial little racist digs at the Ruben Brothers and at Oliver Finegold could be transformed into political opportunities - and so he refused to apologise and instead used these sordid little incidents as springboards for attacks on Israel and the "Zionists" who, he says, are out to get him because he "criticises" Israel. Livingstone opposes the suicide bombing of buses in his own city of London but he makes all sorts of apology for it in Tel Aviv and Jerusalem. Qaradawi is also a man who believes that women should be beaten by their husbands and that gay people should be executed. Deshowitz is seriously wrong, in my view, to raise the idea that we need a debate on torture. But Dershowitz is not a racist, he is not a mysoginist, he is not a homophobe and he is not a supporter of clerical fascism. Dershowitz is actually a supporter of an independent Palestinian state alongside Israel. See that? Engage is sincere and so is Dershowitz. Or to put it another way, Dershowitz is as sincere as Engage. No, David, I didn't say anything that would justify you in ascribing those views to me. I'm sure you are personally sincere in your commitment to human rights and I don't think you are lying for anyone. But I do think that Engage should take care to distance itself from the likes of Dershowitz (and also that you shouldn't minimize how repellent his views actually are, as you tend to above). Actually, Dr Hirsh's partner, Alexandra Simonon is quite a fan of Dershowitz too. Here's Joseph Massad in al Ahram on how desperately, indeed sincerely and substantively, Israel wants peace with its native and neighbouring people. That might be good news but for the fact that Israel will only negotiate on the basis of the natives' acceptance of their racial inferiority under Israel's rule and within Israel's reach. Israel's struggle for peace is a sincere one. In fact, Israel desires to live at peace not only with its neighbours, but also and especially with its own Palestinian population, and with Palestinians whose lands its military occupies by force. Israel's desire for peace is not only rhetorical but also substantive and deeply psychological. With few exceptions, prominent Zionist leaders since the inception of colonial Zionism have desired to establish peace with the Palestinians and other Arabs whose lands they slated for colonisation and settlement. The only thing Israel has asked for, and continues to ask for in order to end the state of war with the Palestinians and its Arab neighbours, is that all recognise its right to be a racist state that discriminates by law against Palestinians and other Arabs and grants differential legal rights and privileges to its own Jewish citizens and to all other Jews anywhere. The resistance that the Palestinian people and other Arabs have launched against Israel's right to be a racist state is what continues to stand between Israel and the peace for which it has struggled and to which it has been committed for decades. Indeed, this resistance is nothing less than the "New anti- Semitism". Israel is willing to do anything to convince Palestinians and other Arabs of why it needs and deserves to have the right to be racist. Even at the level of theory, and before it began to realise itself on the ground, the Zionist colonial project sought different means by which it could convince the people whose lands it wanted to steal and against whom it wanted to discriminate to accept as understandable its need to be racist. All it required was that the Palestinians "recognise its right to exist" as a racist state. Military methods were by no means the only persuasive tools available; there were others, including economic and cultural incentives. Zionism from the start offered some Palestinians financial benefits if they would accede to its demand that it should have the right to be racist. Indeed, the State of Israel still does. Many Palestinian officials in the Palestinian Authority and the Palestine Liberation Organisation have been offered and have accepted numerous financial incentives to recognise this crucial Israeli need. Those among the Palestinians who regrettably continue to resist are being penalised for their intransigence by economic choking and starvation, supplemented by regular bombardment and raids, as well as international isolation. These persuasive methods, Israel hopes, will finally convince a recalcitrant population to recognise the dire need of Israel to be a racist state. After all, Israeli racism only manifests in its flag, its national anthem, and a bunch of laws that are necessary to safeguard Jewish privilege, including the Law of Return (1950), the Law of Absentee Property (1950), the Law of the State's Property (1951), the Law of Citizenship (1952), the Status Law (1952), the Israel Lands Administration Law (1960), the Construction and Building Law (1965), and the 2002 temporary law banning marriage between Israelis and Palestinians of the occupied territories. Joseph Massad has been a specific target for the academic thuggery of the zionist movement both in his adoptive home, the USA, and here for the anti-antisemitism activists of Engage. I remember when Massad wrote a paper strenuously disagreeing with Mearsheimer and Walt, Engage panicked and denounced him for denouncing them for the wrong reasons. I think that was it, but by all means go check. As for those among us who insist that no resolution will ever be possible before Israel revokes all its racist laws and does away with all its racist symbols, thus opening the way for a non-racist future for Palestinians and Jews in a decolonised bi-national state, Israel and its apologists have a ready-made response that has redefined the meaning of anti-Semitism. Anti-Semitism is no longer the hatred of and discrimination against Jews as a religious or ethnic group; in the age of Zionism, we are told, anti-Semitism has metamorphosed into something that is more insidious. Today, Israel and its Western defenders insist, genocidal anti-Semitism consists mainly of any attempt to take away and to refuse to uphold the absolute right of Israel to be a racist Jewish state. At this point a browse around the Engage site could be quite instructive. You'll see that Massad is right. The United Kingdom's public services union UNISON will consider a proposal for imposing a boycott on Israel during its annual conference in mid-June, in the wake of Wednesday's decision by a British lecturers union to back a boycott of Israeli academic institutions. UNISON representatives who are in contact with the Histadrut labor federation have in recent days presented the Histadrut's international activities director, Avital Shapira, with a copy of the proposal. According to the proposal, UNISON, which has some 1.4 million members, will urge other British unions to follow its lead and cut off all economic and cultural ties with Israel. Histadrut sources said the impression they have received is that UNISON will vote in favor of the boycott. The conference will be held June 19-22 in Brighton. If approved, the boycott would have a significant practical, and not just symbolic, impact, given that the union enjoys large economic influence in Britain. According to Histadrut Chairman Ofer Eini, "this is a dangerous decision, because it could harm numerous workers in Israel and their employers, specifically in organizations that have commercial ties to Britain." Histadrut sources said the boycott is likely to take the form of a consumer embargo on Israeli-made goods, as well as an instruction to UNISON's pension funds not to invest in Israel. Eini said UNISON still enjoys significant power in Britain, despite the trend over the past two decades of declining professional union powers in the country, and is deeply involved economically in British companies, including in the private sector. Eini sent a letter Thursday to UNISON General Secretary Dave Prentis, calling on him to immediately cancel the proposal. Eini sent a similar letter to Guy Ryder, head of the International Confederation of Free Trade Unions. "Despite the end of the Israeli occupation of the Gaza Strip, the Palestinians have decided to continue the path of bloodshed and violence," wrote Eini in both letters. "In Sderot and the area surrounding the Gaza Strip live children, women, workers, and pensioners who are suffering on a daily basis due to non-stop and indiscriminate missile fire that cause civilian fatalities and destroy homes and factories," he continued. "The Palestinians' path has turned the residents into refugees in their own country, who are forced to wander to tent camps in safer Israeli cities." Ah now I'm starting to get it. We're supposed to fall for the charade of the Gaza withdrawal and ignore Israel's various blitzes on the place whilst over-reacting to home-made rocket attacks from a besieged Gaza. And then the humour. I used to love Jewish humour, you know, the self-deprecatory stuff, but Israelis just aren't funny. Histadrut sources called the proposal an escalation in the negative attitude toward Israel in Britain, given that professional unions generally maintain solidarity with their counterparts in other nations, regardless of the geopolitical situation. I read once that a South African union issued the call, "white workers of all countries unite!" How true it was I don't know but this one comes pretty close. In its 2006 conference, the union rejected a proposal to impose sanctions on Israel while harshly criticizing Israeli policy in the territories. Ah now, they really need to broaden this to focus on Israel's structure and not just its behaviour. But anyway, let's see how we go this year. What ever happened to the Hamas mandate? The rout of Fatah's military forces in Gaza was as sudden as it was unexpected. Only months ago the Palestinian movement summoned tens of thousands of supporters on to the streets, but yesterday Fatah officials were fleeing ignominiously in boats. The house of the Fatah commander Mohammed Dahlan, the chief hate figure of Islamists in Gaza, was stripped bare by looters and green flags were flying over the National Security headquarters, the residence of the Palestinian president, Mahmoud Abbas. Nobody could have been more surprised to find themselves controlling the streets of Gaza than Hamas. Just as they were unprepared for the victory they won in elections last year, Hamas must be waking up today and asking themselves a familiar question: what now? There are no obvious or easy answers. The border crossings with both Egypt and Israel are closed. No aid can get in and an extended closure would rapidly lead to a food and medical crisis for the 1.4 million Palestinians penned up inside. Hamas said its forces would take up positions at the crossings, but neither Israel nor Egypt, which withdrew its mission to Gaza yesterday, is in any mood to let them. Hamas will need someone to negotiate on their behalf with Israel, which supplies both the water and electricity in Gaza. There are wider questions. Before this conflict started, two political grievances were unresolved by the Saudi-brokered Mecca agreement and the creation of the national unity government. They were the issues of who had control over Palestinian security forces and the question of Hamas's role within a reformed PLO. Control of Gaza could provide Hamas with more leverage in future negotiations, but in the immediate future neither of these two objectives is advanced. Nor does the creation of a mini-state, a Hamastan, make any sense to an Islamist movement with national Palestinian aspirations. If there was little chance of winning more support in the West Bank before this week's bloody events there will be even less chance now, when the air in Ramallah is thick with calls for revenge. But the biggest question is the fundamental one. Without unity there is no chance of ending the occupation and achieving an independent Palestinian state. Without an end in sight, where is civil war taking the Palestinian people? Each question points to the same answer: fresh negotiations between Fatah and Hamas, and a new attempt to create a national unity government. But will Fatah be in any mood to talk to Hamas after its humiliation in Gaza? Hamas said it would grant an amnesty to senior Fatah officials it had captured, although members of its military wing, the Qassam Brigades, were reportedly searching houses in Khan Younis and Rafah for Fatah weapons. The Hamas spokesman Abu Obeideh said their battle was not with Fatah as a whole, but with the faction that "provided an external agenda" - a reference to Mr Dahlan's group, which has been armed by the US. The sweep against Fatah is a return match for a major crackdown that Fatah conducted against Hamas in 1996, but none of this will persuade Fatah to talk. Mr Abbas's authority as president has been much weakened, but he has not lost all power. His declaration of a state of emergency and decision to fire the Hamas-led government will have no effect in Gaza. But the appointment of the economist Salam Fayyad as prime minister could well persuade Israel to release the funds that it has been withholding from the Palestinian Authority. With them could come money from the EU and donor countries. There can be no excuse to continue the international boycott of a government that no longer contains members of Hamas. This will mean that funds, denied to Gaza, will start flowing into the West Bank, widening the gulf between the two. Militarily Hamas have never been stronger, but politically they may well be in a weaker position than they think. In other articles I had read that Hamas would score as well in elections as it did in the previous one. Nothing has happened to water down their democratic mandate as far as I can tell and yet there is no mention of either elections or the mandate arising out of the same whereas there is reference to Abbas's "authority." Now I don't know whether Hamas's victory was "pyrrhic" or not but I don't see how any article on this can refer to Abbas's "authority" without referring to Hamas's mandate. Coup d'état? what coup? what état? Unbelievable! Hamas's victory over Fatah in Gaza has been described as a "coup d'état" by Margaret Beckett, the UK's foreign minister. I've found the coverage quite remarkable so far in that I haven't heard one credible, even respectable, commentator blame anyone on the Palestinian side for this. Maybe I haven't been paying attention but I thought the conditions for a coup d'état were a state and an overthrow of its legitimate authority by unelected forces, like say, the army. Or do we have to redefine state now to make the zionists look generous? Certain of your correspondents appear to be operating under a misapprehension (Letters, June 12). The recent decision of the University and College Union congress was to organise a debate on whether an academic boycott of Israeli academic institutions would be an appropriate response to the occupation of Gaza and the West Bank. It was not a decision to inaugurate such a boycott. We are perplexed at the suggestion that there is something improper or undesirable about such a debate. The opponents of the boycott debate argue that a boycott is inimical to academic freedom, yet they are engaged in a campaign of vilification and intimidation in order to prevent a discussion of this issue. While defending academic freedom, therefore, they seem only too willing to make an assault on the freedom of speech. The UCU congress and its members have a right, and arguably a duty, to confront the ethical and political challenge represented by the repression in the occupied territories. A boycott may not be the appropriate conclusion to the debate, or the most effective action, but it is neither irrational nor anti-semitic to discuss it as one possible response. Some of us are not yet persuaded of the tactical efficacy of a boycott, and may never be so persuaded. Some of us are persuaded. We sense, however, a greater danger to academic freedom and collegiality: the increasingly hysterical and often offensive attempts to close down discussion of what must be one of the central moral and political challenges of our age. · Passing Al Quds University entrance in Jerusalem recently I was shocked to see it surrounded by the separation wall, with one tiny entrance guarded by an Israeli soldier. Palestinians there told me they wanted to go into the university and study but were being refused entry. I asked the soldier to let them in and he refused, so I asked him why and he simply said "I'm under orders". I talked to him for a while about their human rights and about academic freedom and he just repeated that he was "under orders". I was not sure about an academic boycott up to that point - the incident changed my mind. Now I think the ball is in the court of those who oppose the boycott and claim that it will be "bad for Palestinians" and "bad for academic freedom" (advert in the Guardian on June 13) to explain how they will campaign for academic rights for the Palestinians - the conditions are so bad that silence is no longer acceptable. The best way to avoid a boycott is to get rid of such "orders" and the occupation so that people can live and study in freedom; when there is equality of educational opportunities there will be no need for a boycott. · The UCU has called for discussion of an academic boycott of Israel. Its general secretary, Sally Hunt, makes it clear (Letters, June 14) that she opposes a boycott and would like the issue put to a ballot of all members. My own union the National Union of Journalists has gone much further. A motion passed at its conference calling for a boycott of Israeli goods is now union policy. Yet our general secretary sits on his hands, refusing to give leadership on this issue. Many NUJ members who value their reputations as impartial journalists are dismayed and embarrassed by their union's stance. Don't they at least deserve a ballot? · I fully accept that supporters of the academic boycott of Israel are not necessarily anti-semitic. Can they accept that Jewish opponents of the boycott are not necessarily supporters of Israeli policy regarding Palestinians? Perhaps the most depressing story (among many) this week is the report of De Paul University's refusal of tenure to its distinguished scholar Norman Finkelstein (Report, June 12). First, because the decision makes a mockery of academic freedom. In my view, Finkelstein's writings and arguments have never failed to meet the criterion of academic quality, although many have disagreed with them. Second, because 9/11 really does seem to have revivified McCarthyism in the US. Finkelstein has been vilified by those who have simply smeared the arguments with which they were unwilling to engage. Everyone familiar with Alan Dershowitz's responses to those who have attempted to reasonably debate the allegations Dershowitz made in response to Finkelstein's reviews of his The Case for Israel can have little doubt about the stronger argument. And third, because while we have Finkelstein always ready to debate openly, on the other hand, we have his chief prosecutor, Dershowitz, declaring that any attempt by UK universities, or their employees, to advocate a boycott of Israeli academic institutions will be met with legal action. Finkelstein's very livelihood is casually dismissed. I hope a British (or European) university steps forward to prove that we retain values the US has found all too dispensable. · Controversial Finkelstein's scholarship may be, but few academics have suffered so many ad hominem attacks. It's clear the boycott tactic is alive and kicking in the US. The UCU should take no lessons on the subject from that source. And here's a couple on Gaza but I didn't like one of them so, in the interests of balance, I'm not copying either. the decision to deny Finkelstein tenure is one that everyone who cares for academic freedom should demand be challenged, reconsidered by DePaul and, unless it can be given a thoroughly convincing justification, rescinded. Was that so bad? Clearly Geras feels he ought to make it clear that he thinks Finkelstein a nasty piece of work. I have no opinion about whether Norman Finkelstein should have been given tenure or not, but Norman Geras, whose opinions I greatly respect, thinks that the De Paul decision was suspect, and he is not himself a fan of Finkelstein's work. I don't know why Norman Geras didn't post the comment himself but something curious is happening here. The zionists are in a bind. Dershowitz is now here to help them in their struggle against the suggestion of a boycott of Israel. They know that if Engage has been a liability then Dershowitz will hole them below the waterline. There seems to be an awkward split developing in the ranks of the zionist faithful. Both letters published yesterday condemn the University and College Union for something it has not done. While I support the boycott of Israeli academic institutions, I am delighted UCU conference delegates voted (with roughly 61% in favour) to promote not the boycott, but further discussion of it, and to encourage measures to enable our Palestinian colleagues to make their voice heard in the UK. The pro-Israeli lobby, now deployed like a juggernaut against any rational discussion, threatens to drown out entirely the voices of our Palestinian academic colleagues and their students, who have called for just such a boycott as part of a wider campaign of boycott, disinvestments and sanctions. Both letters also suggest the UCU has been "captured" by a minority on the left - representing "0.15% of the membership". Hardly. This was a vote taken, in the normal way, by national delegates, on motions (and amendments) brought to the conference from branches all over the country, where the thousands of ordinary UCU members were able to shape the discussion. Bill Rammell, the minister for higher education, on a mission of reassurance to Israel last weekend to reject the UCU boycott (Report, June 8) delivered some admirable reflections on academic freedom, that universal value so readily invoked by the boycott's opponents. What a pity, then, that Mr Rammell could not find time to cross the border and visit Bir Zeit University, the leading Palestinian university on the West Bank. There he would find an institution starved of funds because of economic sanctions on the Palestinian Authority and often physically inaccessible to its students and teachers because of roadblocks and piles of rubble. It seems academic freedom and the right to be educated belong exclusively to the occupying power. When those who oppose an academic boycott of Israel fail to condemn an occupation that denies Palestinians the right to a normal education, whether it's schoolchildren suffering daily harassment from settlers in Hebron or students in Gaza blocked from travelling to universities in the West Bank (Letters, June 12), all their fine talk of academic freedom is as dust in the mouth. Yesterday you carried two letters attacking the proposed UCU boycott. You also reported the successful campaign by the pro-Israel lobby to get a Jewish academic sacked (University denies tenure to outspoken Holocaust academic, June 12). It is good to know the various friends of Israel are such avid defenders of academic freedom. Yep, it's hotting up. The hypocrisy is being exposed. We might not win this but to get so much attention for the Palestinian cause is a victory on its own. This "critical mass" thing, of which Dr Hirsh has spoken, now puts us in a win-win situation. Well I never Observed this! This week sees the 40th anniversary of the Six Day War between Israel and an alliance of Arab states. It was the ultimate Pyrrhic victory. Israel saved itself from annihilation, but condemned itself to decades of further conflict by seizing land from its neighbours. It also condemned millions of Palestinians to a life in exile or under military occupation. By coincidence, British academics, as represented by the University and College Union, last week passed their judgment on the Six Day War. They voted to recommend a boycott of Israeli universities in protest at the occupation of Palestinian land. The union will now debate the matter over a year. Apart from the fact that the timing was quite good, there is nothing positive to be said about this decision. It will not ease the suffering of Palestinians and it will not soften Israeli policy. In fact, by snubbing even liberal Israeli academics, a boycott strengthens the case of hard-line politicians who prefer isolation since it justifies unilateralism and disengagement from the peace process. Your editorial attacking the University and College Union for recommending a boycott of Israeli universities in protest against the occupation of Palestinian land ('This academic boycott is an empty gesture', Comment, last week) was unfair. I am not a member of this union, but applaud its efforts to do something about the injustices being perpetrated by Israel on the Palestinians. Your newspaper seems to believe that mildly critical articles are the way to bring the Israeli authorities to their senses. You argue for the freedom of the liberal Israeli academics, but where are the arguments for the freedom of the Palestinians? You are mistaken. Constructive engagement with Israel has had no success and the suffering of the Palestinians increases by the month. You correctly criticise Saudi Arabia, Iran and Egypt for their human-rights abuses. However, unlike Israel, they are not occupying another country, a situation that is manifestly unjust and contrary to international law. It was only targeted sanctions that eventually forced apartheid South Africa to negotiate seriously for an end to its iniquitous system. Your leader repeats the Zionist myth that Israel faced annihilation in June 1967 and in so doing highlights one reason why academics and indeed any seekers after truth should be doing all that they can to bring attention to and end the plight of the Palestinians. Just about everyone involved in planning and prosecuting that expansionist war has now gone on record to say it was a conflict of Israel's choosing. Academics are merely honouring their calling by trying to ensure that their Israeli counterparts honour theirs. Public protests and boycotts prodded Western governments to help bring apartheid to an end in South Africa. They were no empty gesture. Nor need they be if they were applied to Israel, as your leader suggests. I suppose it was kind of big of them to publish letters that even called into question their command of the facts whilst disagreeing with their opinion. What with Tony Greenstein's letter in the Times yesterday, I think zionism is taking quite a battering in the media these days. Certainly, they have lost their monopoly there. Here's Tony Greenstein, amazingly, in The Times yesterday. the Boycott ”, June 7) is not merely the lack of sympathy for the problems that Palestinian students face in gaining a university education, but the total failure to recognise that there is even a problem. Palestinian students in Gaza are unable to access West Bank universities. There is one Islamic university in Gaza, dating from the time when the Israeli military was best friends with Hamas, as it sought to undermine secular Palestinian nationalism. What is this if not an imposed boycott? Palestinian students in the West Bank find it almost impossible to travel to their classes unless they are prepared to spend most of the day waiting at the 500-plus checkpoints that are dotted around the territories. What is this if not an imposed boycott? Palestinian universities find it almost impossible to obtain the most basic equipment or funding because of administrative barriers that no Israeli university would face. There is close liaison and cooperation between Israeli academics and the military at every level. Only this week the Hebrew University in Jerusalem appointed as its Vice-President a former head of the Shin Bet security police, Carmi Gillon. Boycotts are peaceful in intent and are designed to draw attention to a particular evil. From the boycott of slave-grown sugar in the 19th century to the Jewish-led boycott of Nazi Germany in the 1930s to the cultural, academic and sporting boycott of apartheid, boycotts have been chosen when all else has failed. Contrary to your assertion, Israeli universities have not been in the forefront of opposition to the evils of occupation. Israeli academics such as Professor Ilan Pappe have chosen exile precisely because of the hostile attitude of their colleagues to solidarity with the Palestinians. The whole of the media has come out against this boycott of Israel idea and yet where have they been while the most powerful states and blocks of states have been boycotting the Palestinians? The government too has supported Israel. In other words, "all else has failed." Time to boycott. I just saw a "dicussion" between Professor Alan Dershowitz and Tom Hickey of the Universities and Colleges Union (UCU). In it Dershowitz accused the UCU of antisemitism and the Jewish proponents of a boycott of Israeli academia of self-hatred. I have to say that Tom Hickey wasn't exactly on cracking form and I think the problem might be the focus on the occupation rather than on zionism and the state structure of Israel itself. Also he could have mentioned the little problem of how zionists dominate our media and government and opposition, leaving very few avenues to even draw attention to Israel crimes, both structural and behavioural (if that's the word). Now, I'm not promising because I couldn't find it myself, but if you go to the Channel 4 website you might be able to find a clip of the discussion. 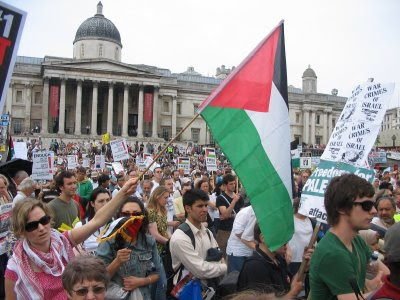 Hamas Prime Minister Ismail Haniyeh addressed around 2,000 pro-Palestinian protesters gathered in Trafalgar Square in central London via satellite on Saturday, who were using the 40th anniversary of the Six Day War to demonstrate against Israel and call for the end of the occupation. The protest, which had been in the planning stages since the beginning of the year, had hoped to attract some 10,000, however. "On this painful anniversary of the occupation of the rest of Palestinian land, I can only stress the following," Haniyeh told the crowd. "First we appeal for Palestinian rights similar to other peoples in the world; second, we appeal that Palestinian people's [have the] right to defend themselves and resist the occupation in accordance with divine laws and international accords and conventions. We emphasize the right of return for Palestinian refugees." The rally was organized by the 'Enough!' coalition made up of UK-based non-governmental organizations, charities, trade unions and religious groups, and protesters called for an "end to the occupation" and "justice for the Palestinians," putting sole responsibility and the onus of blame on Israel. When the coalition was formed, members agreed to work in the spirit of the mission statement, which it says opposes "all forms of racism, including anti-Semitism, Islamophobia, Holocaust denial or Nakba denial." A counter-protest by a group called 'Dayenu!' demonstrated in support of Israel.Organizer Jonathan Hoffman said: "Our group includes Jews, Christians, people of other faiths and indeed of no faith. The one thing we have in common is that we cannot bear the thought of thousands of misinformed and misled marchers on the streets of our capital city with free rein to attack Israel. "Our name 'Dayenu!' is in response to 'Enough!'. We also say 'Enough! ': enough lies, enough Kassams, enough anti-Zionism, enough anti-Semitism, enough boycotts, enough blinkered attacks on Israel regardless of what is happening elsewhere in the world. Israel is prepared to exchange land for a secure peace but also how Israel gave back Gaza, only to be rewarded with Kassam rockets raining down on Sderot." Other speakers at the protest included Azzam Tamimi from the Muslim Association of Britain which is part of the Muslim Brotherhood. Now see this picture from the The Sharp Side report on, apparently, the same demo and consider whether the 2,000 figure may have been a bit if an underestimate. There are more pics on the site. I must say that I'd guess that there were over 10,000 to produce a scene like the one in the picture here at Trafalgar Square. It's certainly an advance on the 500 or so that attended when we marched for Palestine back in the days of Oslo. Boycott or not or boycott what? And who says so anyway? Here's a fairly thoughtful article by Peter Beaumont at the Observer. It has a little round up of what's been going on boycott Israel-wise. I'd say the article's slightly anti-boycott but it looks like an attempt at simply relaying some facts. It starts with a "woman in black" explaining that she boycotts the occupation but she doesn't approve of any boycott of Israel itself. Those in her group - Women in Black - have been abused, sometimes violently, since they began their protests almost 20 years ago. Her activism against the occupation touches all areas of her life. She does not drink wine or buy food or other goods produced by Jewish settlers on land under Israeli occupation. Svirsky believes in boycotting the Israeli occupation. But she cannot support proposed boycotts of Israeli academics by Britain's University and College Teachers' Union, or of Israeli goods by the National Union of Journalists. The philosophy lecturer at Brighton University and the proposer of the motion at the Bournemouth conference calling for the academic boycott, has already seen himself branded 'as an anti-Semite' for backing a boycott over the last two years. A member of UCU Left, an activist group within the union that his opponents have charged with being a front for the Socialist Workers' Party, Hickey insists he is as opposed to anti-Semitism as he is to Islamophobia or any other form of racism. But if Hickey was hoping to open a debate, the response has instead been a ferocious counter-attack from Israel, pro-Israeli lobby groups and defenders of Israel in the US. It has not only angered those exclusively in the pro-Israel camp. The proposed boycotts have also outraged many journalists and academics - among them those with deep sympathies for the Palestinians - for what they argue is an attack on both journalistic impartiality and academic freedom. Already Israel's Foreign Minister, Tzipi Livni, has called to complain to Foreign Secretary Margaret Beckett that the UCU vote threatens to strain relations between the two countries. A boycott of British goods has been suggested in Israel. Further afield, academics like Alan Dershowitz, the Harvard lawyer, have begun circulating a petition declaring themselves - for the purposes of any boycott - to be 'Israeli academics'. Now the point being made in the "if" paragraph is that Hickey may have alienated, indeed "outraged many journalists and academics - among them those with deep sympathies for the Palestinians." So why follow up with what Tzipi Livni, Israel's foreign minister, has called for? Did he think that Tom Hickey wanted a night out at the Oxford Union with Israel's foreign minister? Where are these "outraged journalists and academics - among them those with deep sympathies for the Palestinians?" Look at that paragraph again. Can Tom Hickey really have been seeking to open debate with an old ducker and diver like Professor Alan Dershowitz? Or is it being suggested that Alan Dershowitz has "deep sympathies for the Palestinians?" Ah yes, the Anti-Defamation League. Well noted for its "deep sympathies for the Palestinians." Not really though so I'm guessing he included those as "pro-Israeli lobby groups and defenders of Israel in the US." So where are these "outraged journalists and academics.......with deep sympathies for the Palestinians?" Maybe it was bad editing but they don't appear in this article but we can be sure these "outraged" anti-boycotters "with deep sympathies for the Palestinians" will be invoked many times over the coming months. Just to be clear, I am not saying that there isn't opposition to some kind of boycott of Israel among anti-zionists and anti-occupationists. I am merely saying that to describe them as "outraged" without naming any looks like trying it on. Entebbe, did Israel set it up to set it up?